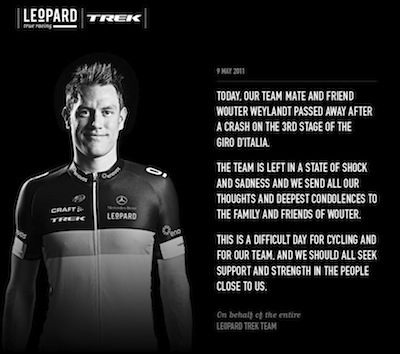 Leopard-Trek’s Wouter Weylandt was fatally injured today in a crash on the third stage of the Giro d’Italia. The 26-year-old went down on the Passo del Bocco and was unconscious at the scene. Paramedics worked to revive the Belgian, doing CPR for an extended period of time before airlifting him to a nearby hospital. Doctors were unable to revive Weylandt.